These days, many young people find that the competition for entry level jobs is very fierce—so much so that to get a job, you need to already have job experience. But if you need job experience to get the job in the first place, how do you go about meeting this requirement? Increasingly, young people are finding that unpaid internships are the only solution. 60% of employers prefer to hire people who have completed internships. As a result, 55% of college seniors report having worked as interns, more than double the figure from the early 1990’s. More than one million Americans work as interns every year, and about half of those are unpaid. That’s at least 500,000 unpaid interns. If each of those interns worked 40 hours a week for 12 weeks at a minimum wage job, each one would earn $3,480. That’s almost $2 billion combined, and a lot of the work that unpaid interns do is worth more than the minimum wage. What’s going on here? Employers love unpaid internships. Instead of hiring someone at an entry level wage, they can get desperate young people to do the work for free. For individual businesses and firms, this is a great deal. But for society as a whole, unpaid internships create lots of problems. People have to do internships because entry level jobs are scarce, and they need to distinguish themselves from the herd. But why are entry level jobs so scare in the first place? By creating unpaid internships, employers are able to reduce the number of entry level positions. This forces young people to compete harder for the remaining jobs, forcing them to bolster their CVs by taking unpaid internships, further reducing the number of available paid positions, and so on in a vicious cycle. And when you do at long last manage to acquire one of those coveted paid positions, unpaid internships weaken your negotiating position with your employer. Young people are forced to take on debt during school and their internships, making them desperate for any kind of work at any wage. Additionally, employers are able to lowball new hires because they can credibly threaten to get interns instead. Together, these forces put new workers on a lower earnings trajectory, permanently reducing their lifetime earnings. In our economy, our workers are also our consumers. If we pay most people less, most people will have less money to spend. Less spending means reduced sales, which means slower economic growth and lower living standards for everyone. Our society continues to try to make up for the lack of wage growth by lending workers money at low interest rates—credit cards, student loans, mortgages, and so on. But without wage increases, it’s hard for workers to repay these debts, leading to bubbles, loan defaults, and economic instability. In the long-run, this is bad for both employers and workers. It’s a no-win situation. When our parents and grandparents were getting their first jobs, it wasn’t like this. Internships were rare, so job seekers could compete for entry level jobs on the strength of their college educations alone. Instead of pushing the cost of training onto young people and their families, burdening them with heavy debts, employers paid to train their own workers. Criminalization–we can legally require that interns be paid and pass rigorous enforcement legislation. Unionization–we can create new unions and empower ones to protect their members from unpaid internships and the financial consequences that stem from them. A short time ago, I had the good fortune to attend an academic workshop on the issue of “wage theft”. Arguably, many unpaid internships are already a form of wage theft–it is difficult to prove that unpaid internships meet all of the existing law’s exemption criteria (you can look at that criteria yourself at this link here if you are concerned that you or someone you know is a victim of wage theft). That said, I see no reason why these exemptions should exist in the first place. The government can and should close these loopholes and prosecute employers who decline to pay their interns the same way they prosecute other forms of wage theft (e.g. not allowing workers to clock in, underpaying workers, etc.). Additionally, the paper presented in the workshop (which has not been published but which was very well-received by the attending academics) presented a compelling argument that the government can significantly reduce the incidence of wage theft by severely punishing employers who engage in it. The most effective law currently in use in some US states is a law requiring wage thieves to pay their employees treble damages. By criminalizing unpaid internships and rigorously enforcing wage theft laws, we can ensure that there’s no longer a financial difference between hiring workers and hiring interns. This forces firms to create more entry level jobs, making it easier for young people to find work and negotiate competitive starting salaries. In the long-run, this empowers workers to spend more, improving employers’ bottom lines too. This needs to be reversed. The government can help by protecting union rights, and schools and universities should educate young people about the benefits of union membership. We need to encourage young students and workers to be aware of their extant legal rights and to exercise them when necessary, not just for their own good, but for the good of the economy as a whole–even for the very employers attempting to low ball them. This is the second entry in the Polished Politics series. The first was “Why You Should Get a Raise“. Interesting post. But what do you think the negative advantages of using govt legislation to make it harder to hire interns? Do you think the negatives are similar to implementing a very high living wage? Below forms the key counter argument from what I can see. By legislating we may push supply of these internships down, in a similar way to minimum wage legislation. Don’t you think where unpaid internships are given it is because of the unique conditons in the field: e.g. scarcity of hiring resources so they have to do a lot of cheap “sifitng”. Flexible markets can self-correct – there is a strong tendency for this (see below). If we were to ban unpaid internships we might just prevent a firms cheap sifting strategy and: 1) effect process of matching people to jobs (bad for business and economy) 2) decrease the supply of these internships which give people key skills. Markets are useful because they allow experimentation – if a producer “bets” on a completely original hiring strategy, if it pays out it will pay out BIG (more talent on the cheap) given it is unique. Then hopefully the practice will spread. In the UK at least there is a lot of this experimentation: some internships are paid at the pro-rata rate for the post (finance), some are unpaid but give travel expenses, some (like at think tanks) are paid in different ways (free lunches etc). The cheap sifting strategy passes the cost of hiring onto workers, allowing firms to underfund hiring and training. This creates barriers to entry for workers who cannot bear these costs (a significant equal opportunity issue), increases the debt burden on those who can, and creates a race to the bottom effect, dragging down wages for workers throughout the industry and encouraging other firms to adopt this same strategy. It would be unreasonable to ask firms to abandon this strategy of their own accord because of the short-term advantages it offers them, but if the state can eliminate this strategy for everyone, it will make it possible for all firms to fund hiring and training without putting themselves at a disadvantage. In sum, I think the social disadvantages vastly outweigh the benefits. It is not a perfect situation I agree – to the extent that is that no situation will be perfect. but notice that as real wages increase (with economic growth and productivity) there will be more pace for experimentation and a growth in internships that are funded. The unintended consequence I fear will be a complete decrease in supply of all unpaid internships, which would be awful for everyone including some of the poor who can get the experience. This idea of race to the bottom I think is also misunderstood. Socialists for decades have had some odd idea that wages will be pushed down for the poor (it is a central prediction of Marx) but this ofcourse has been falsified decade on decade. As John stuart mill explained (not exactly a crazy right winger) these socialists forget the other side of the market: real wages have increased (poor have consistently become wealthier) because of competition for workers driven by new technology etc. The same will happen for internships…they will improve in quality if given the time. Ps. 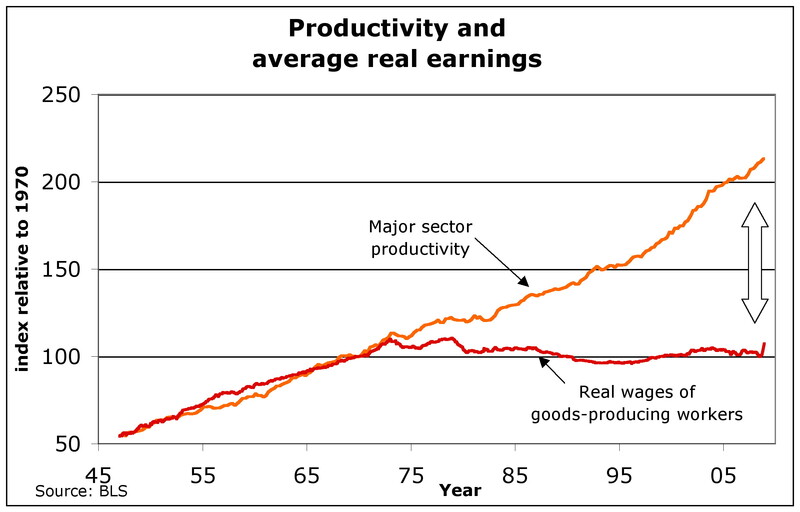 The productivity wage graph is interesting. But I do not think it shows a systematic failure of the rule that productivity increases wages. The divergence of curves may just be because now productivity increases are occurring at key sectors that are hard to access for the average person (computing, pharmeceuticals) – and so only people in these fields are experiencing real wage rises. Thus the solution is to aloow better matching in labour markets – bring up the skill levels of the average man.